When designing a room, whether it’s a blank slate or a refresh, you work in layers. You have a lot of choices to make, and the best way to work is from the bottom up. That means start with the rug! Before you can choose your furniture or accessories, the rug is the foundation should guide the color and material choices of the space you create around it. This bottom-up approach is central to the BB Interiors method. Here’s how to make it work for you. Natural materials tend to be more expensive, with wool clocking in as the priciest option compared to cotton and sisal. Synthetic materials including polypropylene and nylon will be less expensive, and some can be styled to mimic the look of pricier, natural material rugs. As you get a sense of the style you’re looking for, limit your search by the boundaries of your budget. Expected wear-and-tear, the lifespan of your rug and how easy or difficult it will be to clean and maintain are also factors to consider when setting your price point: a rug you have to replace in three years may be pricier in the long run than an investment piece that will last a lifetime. Narrowing that down brings us to item two: decide how you will use this rug. Think about how you will use the room that contains this rug. Will it weather a lot of traffic, like a hallway, mudroom or well-used family room? If so, wool is resilient and stain-repellant; wool and cotton are easy to clean. Jute and its cousin, hemp, are harder to clean, and can be rough and scratchy, so they may not be right for a room where kids will be playing or sitting on the floor. If you have pets, sun exposure or lots of foot traffic, synthetic rugs may be a good choice. It may be tempting to begin your rug search with a palette or style in mind, but trust us: material must come first. If you fall in love with a thick, knitted natural wool rug, or the rustic look of jute regardless of how it fits into your color scheme, it won’t matter what your initial vision was. And if your budget just won’t allow for a luxe statement piece, you don’t want to plan your room around one. The main materials you’ll choose from are wool, polypropylene, nylon, cotton, silk and sisal. To help you narrow down your material choices, ask yourself two questions: what is my budget, and what do I need from this rug? Now you’ve got a material in mind—but we’re still not ready to shop. Next, we need to nail down the shape and size of the rug you need. If the furniture for the room has already been selected, then those pieces, plus the size and shape of the space, will make a big difference. Do you want your rug to fill the room, or create an area of interest within the larger space? Do you want more than one rug in the room? If there are couches and chairs in the mix, will the rug stop in front of them or extend beneath them? There are also shapes to consider: most common are rectangular, oval, square, round, irregular or long, narrow runners. With your rug material, size and shape in mind, you’re ready to find The One. Then we can start the work of pulling the rest of your room together. 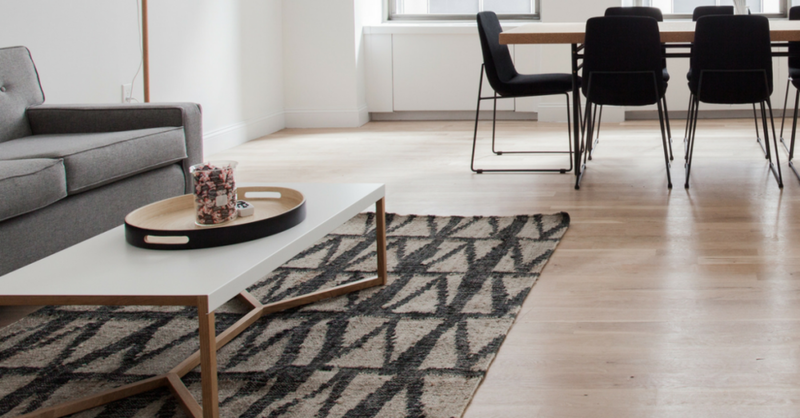 Follow your heart when choosing the right rug for your space, because it will be the centerpiece—figuratively and literally—of everything else you assemble to create that unique space. Finding the right combination of pieces that mix and match to send the right message is part art, part science, and we’re experts at both. Need a hand? Get in touch with BB Interiors today!